I like reading, both for pleasure and as a great way of educating myself. A nice combination is when the educational book is written in such a way that it feels like pure pleasure reading. Michael Lewis is an example of such a writer for me. His books become page-turners for me, I just can’t get enough. Slightly more heavy educational material, usually get’s a bit boring and dry. The book Thinking Fast and Slow by Daniel Kahneman was a typical love/hate relationship of the sort. The book material was extraordinary interesting, probably top 3 educational book I ever read. But written in such a way that halfway through the book I really struggled. 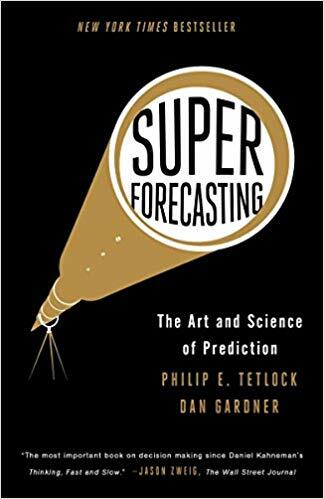 The latest book I read, Superforecasting: The Art and Science of Prediction, is an easier read. It draws some of it’s material from Kahneman’s book and for an equity investor like me it was almost more intriguing and interesting. In a 20 year very impressive study, Professor Philip Tetlock showed that even the average expert was only slightly better at predicting the future than “monkey’s throwing darts”. Tetlock’s latest projects has since shown that there are, however, some people with real demonstrable foresight. These are ordinary people, who are nonetheless able to predict the future with a 60% greater degree of accuracy than regular forecasters. They are superforecasters. This book resonates with me on multiple levels, but what spoke to me the most, was Tetlock’s description of perpetual beta: “a computer program that is not intended to be released in a final version, but will instead be used, analyzed, and improved without end.” As you might guess, we are not talking about computer programs really, but rather an approach to life itself. I finished my Masters studies many years ago now, the first few years working in Finance was very intense and I really learned a lot. But later on, I realized I had started to fall back on old knowledge in many occasions. I was still learning new things, but at a much slower pace than at Uni (or the first year working). And I realized I didn’t like it. It’s somewhat hard to explain, I have this need to constantly keep learning and understanding new things. I’m just very curious about understanding things. From how people think, to how a certain company operates and how it all slots in together in the bigger picture and the world we live in. Since back then I have found multiple ways to keep developing and improving: proper financial studies with exams, reading books on topics I want to understand better, listening to podcasts, reading blogs, following great people on Twitter and vloggers on YouTube. The world is today filled with so great, easily accessible ways to keep learning! The latest way of improving is my very own blog, where I can structure some of all that information I take in and do something useful out of it. One of the main points of the book and how to be a superforecaster, is to constantly keep learning and improving. Or in Tetlock’s words in the about superforecaster Bill Flack: “I can’t imagine a better description of the “try, fail, analyze, adjust, try again” cycle—and of the grit to keep at it and keep improving. Bill Flack is perpetual beta.”. Just like Bill I’m trying to very humbly be perpetual beta as well. This long explanation in a Financial context is such a nice way touching upon my very first post on the blog, where I tried to argue that it’s important to know what your benchmark is: Know your benchmark. Because if you do not know your benchmark, how can you then even start to test how well your investment strategy is doing? 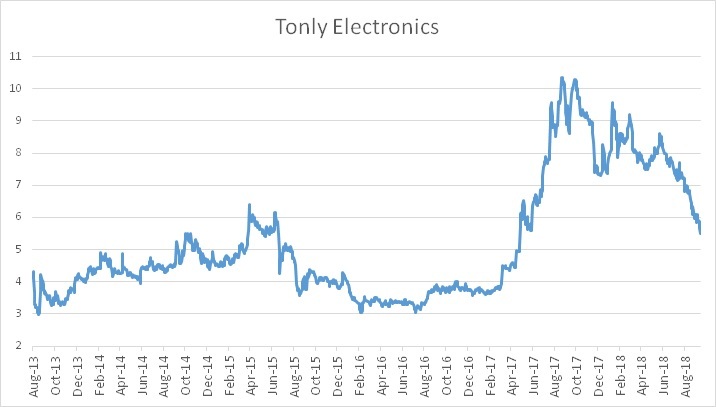 How good was my forecast in Tonly Electronics? So far it seems I’m very far from being a superforecaster, when non of my three investment scenarios managed to capture the total Sales of Tonly would come in for Q3. Sales came in higher than my Bull scenario! Given the great results on a revenue basis and that the stock has traded down another 10%, I decided to allocate all the cash I had left, into Tonly (which was about another 2% of my portfolio) as of Friday. These Sales results doesn’t mean it’s a home run, something could still have happened to the margins, that we have to wait until next year to know. 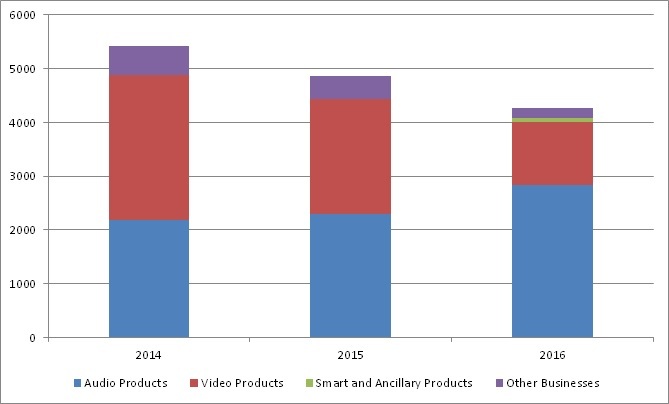 One could also notice that the segment I thought would drive future growth, with smartspeakers, did not actually even live up to my Base case of 550 million HKD. So although New Audio Products delivered extremely strong, it was still not a perfect report. One should not make too big of a deal of a quarter either, but very nice to see the execution of this company and I can’t believe that the market did not take notice of this at all and actually traded the stock down during the day (it ended flat, where I took my position at 5 HKD per share). To book brought up how hard it is to forecast something, and the further out in time you go, the harder it gets. The message more or less was, forecasts further than 5-6 years out is more or less meaningless, at least from trying to have an edge in guessing outcomes. I leave this post with a letter which was mentioned in the book, as a way of proving this point. 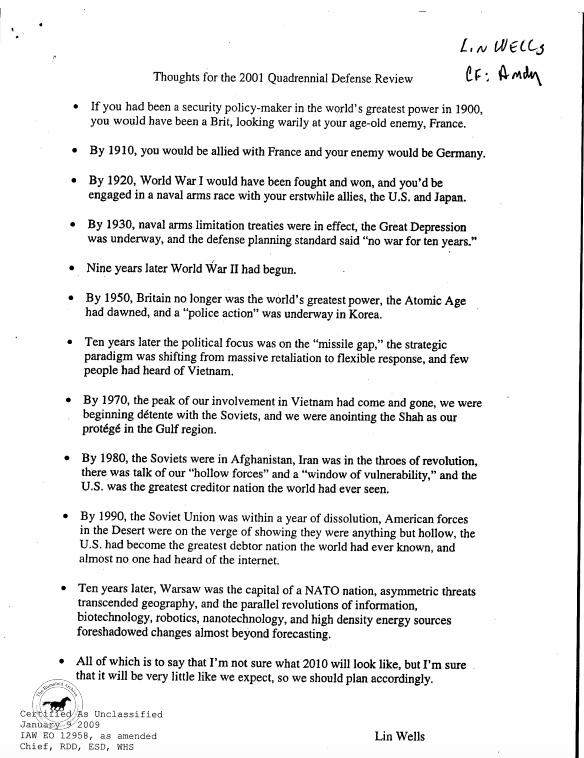 The letter was written in April 2001 by Linton Wells, who at the time was principal staff assistant to President George W. Bush’s secretary and deputy secretary of defense.